Last week the annual ritual of acknowledging aging descended upon me, and my loved ones consoled me with gifts evoking youth and whimsy - including this fun and girly bicycle dress. 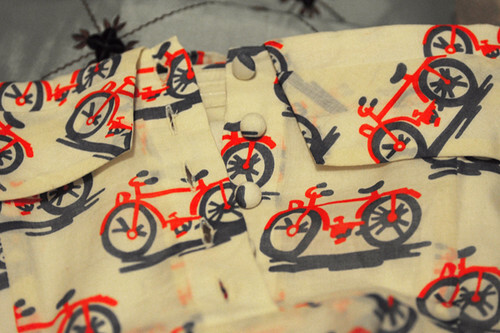 But can a cotton frock covered with a colourful, geometrically improbable bicycle print cure existential ennui? Why yes, it can. I wore it on the day in question despite the winter temperatures, and found it impossible not to have fun. Promoting frolicking to the extreme, it was a fantastic gift. 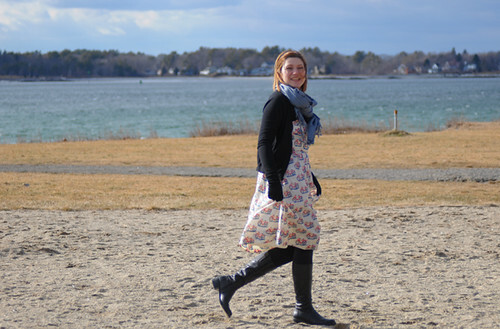 The Anthropologie Bike Lane dress has figured prominently in the velo-twitteverse since it came out earlier this winter, and so I thought I'd post a review for others considering it. The calf-length strapless cotton voile dress has classic 1950s styling: a rigidly tailored bodice and a full, loosely pleated skirt. 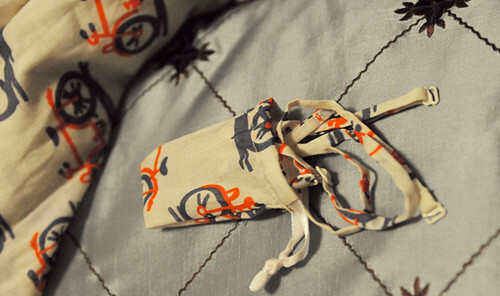 The colour of the fabric is a vintagey cream, with the bicycle print in faded ink-blue and bright vermilion red. Both the skirt and the bodice are fully lined. I received this dress in a Size 2, and was sure that I would need to exchange it. But to my surprise, the small size fit me and I was even able to wear it over a long-sleeve wool baselayer. The design requires the bodice to be very form fitting, or else it won't stay up. Any larger and the dress would have been too loose. I would say go down one size from what you normally wear, and other reviews of this dress seem to suggest the same. Despite the whimsical print, the Bike Lane dress is not trivial to get into. The construction is surprisingly traditional (read: complicated). The bodice is corseted, with flexible plastic boning sewn in at the rear and sides. There are two systems of closure: a long zipper on the side, and buttons along the back. Depending on how flexible you are, you may or may not be able to get into the dress on your own. The buttons along the back are cloth-coverd and very pretty. They are also rather difficult to button and unbutton, because they are large and the button-holes are small. The Anthropologie websites describes them as "decorative," but technically that is not accurate since they actually function to open and close the dress in the back. I think what they mean is "decorated." All the tailoring does serve a practical function, in that the dress really does stay up without straps. The corseting and the pleats criss-crossing the front also make it possible to wear it without a bra for those who require only moderate support. Optional straps are included with the dress and they can be attached to sit either straight over the shoulders or crossing at the back. 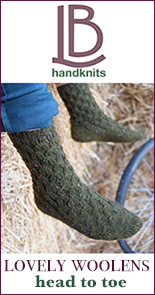 But if you are going to use the straps, I suggest sewing them in, as the hooks do not always want to stay in place. While the Bike Lane dress is complicated to put on and may not work for all figures, if the fit is right it is very wearable and easy to move around in. There is nothing cycling-specific about this dress, but it is certainly "bikable." 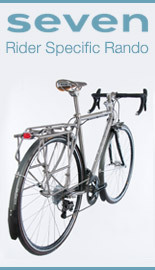 The full skirt makes it easy to step over a frame and to pedal, and it's not so long as to be prone to flying into spokes. The corset in the bodice is flexible and does not constrict movement. The quality of the fabric and craftsmanship is good, with a lot of little details that give this dress an elegant simplicity. I will probably wait for Spring/Summer to wear it again, and the gauzy voile should be comfortable on warm days. The very recognisable print means that it can't possibly be an everyday dress, but it's perfect for special occasions. 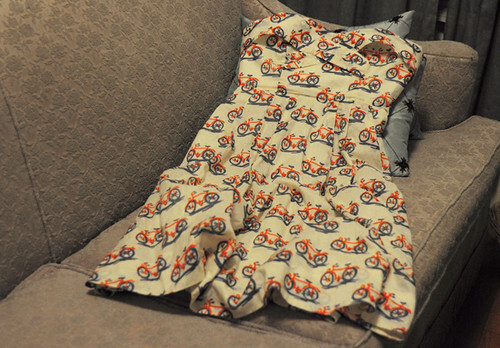 A great gift for bicycle-obsessed ladies with a penchant for vintage tailoring. I don't understand how you could happily wear a dress whose every bicycle suffers from obvious TCO. Yeah, until you pointed that out, I was all set to wear this in my next cyclocross dressing event. To wear it in any venue would be so disloyal to V. We all know how she feels about toe overlap. Your lack of scientific rigor shocks me. If you study the print more carefully, it is obvious that it is the poor fender line causing the TCO. Once we fix that, the front-center is more than sufficient for toe clearance. What size are you normally at Anthropologie? I am usually a US 4, but Anthropologie sizing seems to be all over the place for me. I have a blazer from them in size 6 that is almost too small, and a jacket in size 4 that is slightly too big. If you search for reviews of the Bike Lane dress, they consistently suggest to size down. I saw it in the catalogue and looked for it the last time I was in Greensboro. Sadly, they had not gotten it in yet. Thanks for the review. Now I really want it! Cute dress, but I am actually even more taken with the sofa. Thanks. It was purchased in a used furniture shop in northern New Hampshire in 2005. No idea of its vintage or origin and it's now been heavily "catted," but I love it. A couch that does double duty as a scratching pole is a great couch indeed! Heh heh, our sofa got so catted that even the local charity wouldn't pick it up. Thankfully our cats don't like the texture of the new one. Very adorable! Sad it doesn't come in sizes over 16. I splurged and got this dress some weeks ago when I was suffering from a bout of winter blues. And this dress perked me right up. This is one of those kind of dresses that tend to flatter a range of body types. I have some curves and it looked just great. And being tall, I was relieved that it had a great length to it as well. 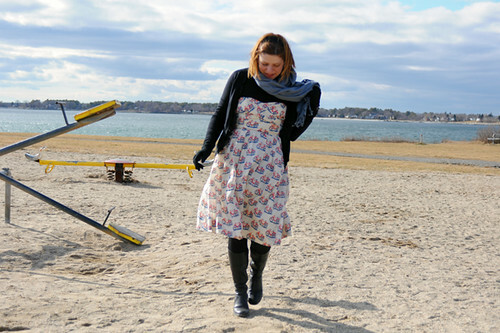 My only negative about this dress was that I thought I had to wait and wear it in Spring. But how you layered it, V, totally works for winter! I shall wait no more! 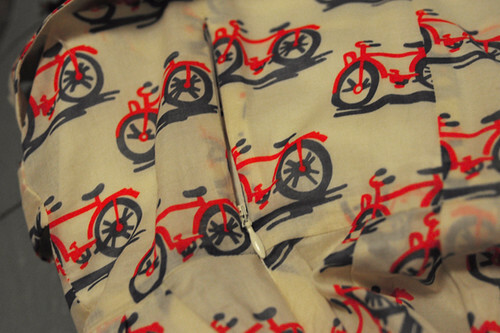 PS - Anthro also has a bicycle print blouse. They are really on a roll. Oh wow. 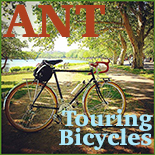 Fans of ANT bikes might like both versions of that blouse. Happy Birthday! Cute dress. Would love to find the fabric somewhere! I bought this dress in my usual size 6 and it was way too big. Exchanged it for a 4 and that fits fine. On the other hand, my friend bought one in her usual size 12 and it was spot on. It is possible that only the smaller (single digit?) sizes run big, but the larger ones are true to size. It would not have occurred to me to wear a strapless dress over a long-sleeve T, but your outfit really works! The big blue scarf and the slim cardigan keep the proportions interesting. I feel like if your boots were a different color (red ankle boots?) the look would be perfect. The only pair of red boots I've ever liked were these really cool ones by Camper, but they no longer sell them. Alas I only own black boots at the moment. Ha yes, and there is also this : ) Great day. Great dress, but I ended up returning it. I loved how it looked online, but in person I have to say the fabric looks kind of dirty, like it's yellowed with age. The corset isn't my thing either. I have a skirt I sewed myself out of bicycle-printed fabric. I LOVE the skirt, but the bicycles are printed so tiny that most people don't notice the bicycles unless I point it out to them! The bicycles on your new dress are MUCH bigger. Last week the ritual of acknowledging ageing descended on me too! Happy Birthday! I am totally enamored with the dress's adorableness! Looks super sweet on you, V! Ohhh that is so cute! :) My college budget wouldn't allow for it, but I will dream of sewing an imitation of it. Dress looks cool. My wife had a brief addiction to Anthropologie; I hope to one day recover financially. Zorro will have you know that the boots are Canadienne and some of the most practical boots in existence. Absolutely non-slip on snow and ice, waterproof and freezing temp proof. Perfect for cycling! An Anthropologie addiction is bad news and some of my good friends have been lost to it. I am glad she got treatment. Veredictum: I'm not going to judge your footwear, sight-unseen, but a lot of ladies are wearing fake cowboy boots for what now passes as "fashion". This style of boot certainly has its origins in horse-back riding. As for Veloria's boots, regardless of your gender, if you go to images.google and type in "zorro boots", you'll get a whole lot of what V's wearing above. These are not Zorro boots. Zorro boots have pointy toes and these have round toes. I love my Canadiennes in the winter. Rob, as I said, a man's take on female fashion does make me chuckle. My boots are classic equestrian styled rather than cowboy styled. Women will know the difference. Although cowboy chic is also popular here on this side of the pond. I don't think Zorro can stake a claim to V's style of boots... thanks for the chuckle though. The biggest cause for chuckles here is that I called them "Zorro Boots" in jest, and another commentator called me out on the true classification of Zorro boots. To me, it's funny that they really do market these things as such. Veredictum, I really don't think this is a gender thing. This is more of a personal priorities thing. Some ppl (males and females alike) are into "fashion" and others are totally unconcerned. Many ppl, myself included, believe that fashion went out of style decades ago. Rob I have some friends who sit in your camp. Personally, I like fashion, and see it as a form if self-expression, adding colour and individuality to people. Of course, when people become slaves to fashion trends it has the reverse effect, making society appear more like mass produced, cardboard cut outs.As much as fashion can be about the unique or different it can also be about cobformity. Similarly, people subject themselves to all sorts of discomfort (six inch heels for example), for the sake of trends. Balance is the name of the game. When people say they are not interested in, or not influenced by fashion, what they technically mean is that they are passive consumers of fashion. After all, there is no such thing as "trousers" or "jacket" or "shirt." There is a myriad of stylistic possibilities, and you either actively choose a specific style that appeals to you, or you disinterestedly buy whatever is cheapest or most easily available in the stores. Either way you are a consumer of fashion. In the later case, your fashion is simply determined by a corporate trickle-down effect. I tend to try to be a responsible consumer wherever possible. I do make an attempt to buy domestically produced clothing and shoes when I can, which has resulted in a look that lies somewhere between "cowboy" and "militia enthusiast", with some surprisingly appealing t-shirts thrown in for good measure. Sadly, when I buy clothes that are more "business casual" for work, there are very few (if any) domestic options. To be fair, one could argue that what I'm doing with my attire is still driven by fashion, but the aesthetic aspects are replaced by a self- righteous quest to seem at once socially responsible and hillbilly. "Yeah, I might be wearing a brown duck chore coat with fatigues and mailman shoes, but at least they were made in the States!" Thank goodness I'm already both married and employed; otherwise, I'd be doomed. Rob, I tend to agree with Velouria. Whether you buck orevailing trends or not, and whatever your ethos, you do seem to be making conscious decisions about your wardrobe. Your fashion statement seems to be all about where the clothes are made! You can get business and business casual clothes made domestically by going to a tailor or seamstress. It is not necessarily expensive, at least no more so than a decent suit costs retail. Small-time tailors aren't flashy but can do an excellent job. Happy Birthday! You look fine in that dress. I would totally be willing to carry your books home for you, beat somebody up for you or shoplift gum for you any time you asked. A belated Happy Birthday Velouria! That dress looks stunning on you - definitely needs a classic bicycle to go with it :-)... hmm, methinks you might have one or two that fit the bill. Saw this dress a few weeks ago at Anthro and wanted it instantly!! Sadly it was way over my budget (as most things at anthro are). It is so cute and has such a great cut. You look lovely in it! 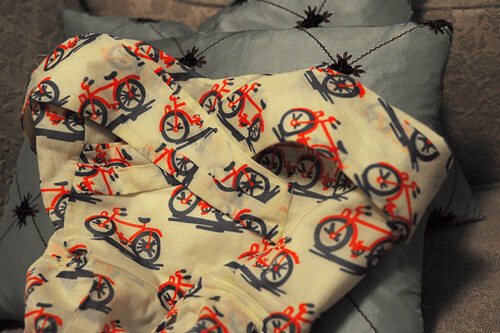 I few years ago I saw this bike dress at Anthro (http://www.whatyoulove.net/images/bicycles1.JPG) and decided to wait for it to go on sale but it never did. Missed my chance! I really like what Anthroplogie does and love browsing their fashions, the sense of style and decor is very spot on. Does anyone know if there is a male equivalent out there? I believe the same company owns Urban Outfitters. I wonder how many of us are Team Aquarius? I don't know if we share a birthday, but we clearly share a birth-week. Happy Birthday! 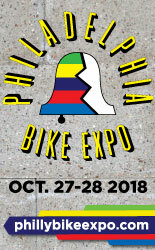 I've been studiously avoiding buying all the bicycle-themed stuff out there because I'm afraid of what might happen when the trend moves on, as these things do. Will media mention that bikes are now "out"? Wouldn't that be a shame?